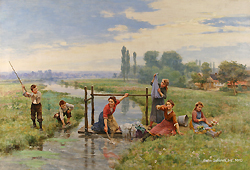 From vigorous and healthy little peasants with sun-tanned faces, to the birds in the sensitive nest maternally prepared, to the small flowers still dripping with dew; a simple landscape into which May spreads her light and her joy, here is all that is necessary for an artist to satisfy his eyes and permits us to experience the candid charm of rustic life. The mid-nineteenth century was a period of great transition in France, affected most notably by industrialization. This transition was not just part of the social and economic culture of France, but found its most important representation in the art of the period. The advances brought about by industrialization began to threaten the traditions of many sub-cultures, most notably that of the peasantry. Time-honored traditions, the value of hard-work, and the importance of the family structure were all aspects that were challenged by modernization. To represent this dying way of life, artists resorted to several methods, some highlighting the hard working nature of the peasant, some glorifying them as the embodiment of perfection and stability. Cesar Pattein, in his interpretation of rustic life, depicted the gayness of the life of the peasant, focusing on the relationship between the figures while at the same time preserving, on canvas, the life that by Pattein’s period, was virtually obsolete. Into a family of farmers in Steenvoorde in the north of France, Cesar Pattein was born on September 30, 1850. He first studied engraving under Guillaume Alphonse Cabasson. In 1878 he entered the Ecole des Beaux-Arts de Lille in the ateliers of Alphonse Colas, a portrait and religious scene painter born and raised in Lille, and a Mr. Bascoppet. Pattein exhibited for the first time at an exposition in Lille in 1881, where he showed Portrait d’une Fillette (Portrait of a Young Girl). Throughout his career he remained deeply involved in many expositions in cities outside of Paris, showing that he held strong ties to his native city. This same year he was forced to go to Arras for military service and he ended up spending nearly eight years there, during which time he concentrated his efforts on commissioned portraits and also scenes of rustic life. It was in Arras that he became very much involved in the Union Artistique, a group which held yearly exhibitions. He exhibited at these expositions well into his career, beginning in 1883 with La Sarcleuse (The Weeder), and Pré Fleuri (Flowering Prairie). Still, the best known Salon was certainly that of Paris. For the past few centuries artists had used this as, in many cases, the only introduction of their works to the public. Thus, Pattein was also an active participant in the annual Parisian Salons. He exhibited there for the first time in 1882 with Bulles de Savon (Soap Bubbles), while still under the tutelage of Colas and Bascoppet. Pattein had dual residences, spending time in both Paris and Steenvoorde. Between 1883 and 1884 Pattein left the atelier of his former masters and entered that of the celebrated artist, Jules Breton, who, during the course of Pattein’s career, influenced him greatly. Before meeting Breton, Pattein dabbled in a brief period of religious and historical scenes but soon became entranced by visions of the peasantry, a subject that spawned some of the greatest painters of the mid to late nineteenth-century. Very often he would execute the landscape en plein air and then paint the figures while he worked in his studio. These types of scenes earned him a silver medal at an exposition in Amiens in 1885 and also in Paris at the 1896 Salon for L’Absence du Peintre (Absence of the Painter) and in 1906 (La Jeunesse s’amuse – Youth Amuses Itself); he received third-class medals at these Salons. Outside of his recognition at the Salons, he was growing in popularity with the public. The reasons for his popularity are not difficult to identify. 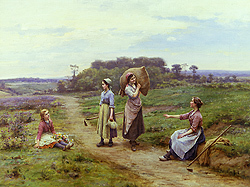 These peasant or rustic scenes, by Pattein’s time, had become a tried and true type of imagery heralded at the Salons, and certainly made most apparent by Pattein’s master, Jules Breton. Pattein focused on the happy times of the day, his figures interacting, laughing, and forgetting the toils of the hard day’s work. On top of this, many of these depictions involved children and thus focused attention on the value of the family and interaction with children, both of which became issues during this period. Beginning in 1900, Pattein began exhibiting in Arras at the Galérie Vasse, where he first showed Supreme Effort (Supreme Effort). He exhibited here fairly exclusively towards the end of his life, showing for the last time in 1912, a worked entitled Un Nid d’Oiseaux (The Bird’s Nest), the same painting described by the author in Le Magasin Pittoresque of 1902, in which it was also reproduced. During the early part of the turn of the century he also began traveling more extensively and visited the areas around Hondeghem, Bailleul, and Hazebrouck. There is little known about the latter part of Pattein’s life and career. He died on January 26, 1931 in Hazebrouck in the north of France.